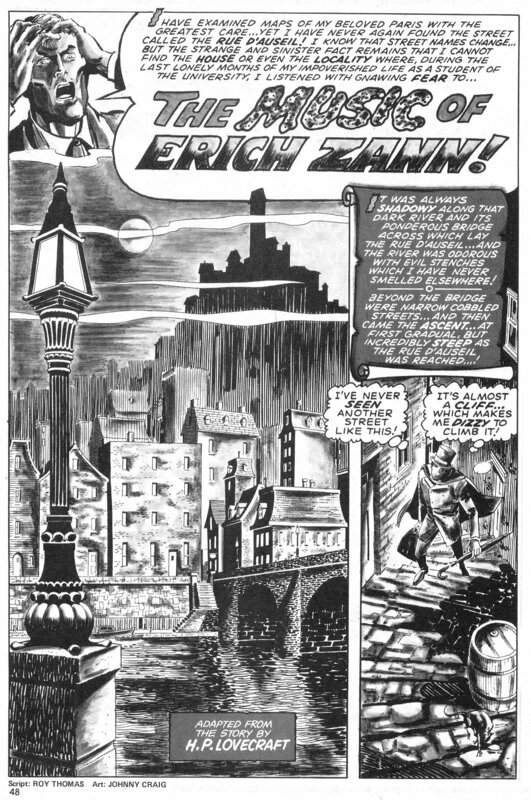 As a young child, growing up in the UK, the Groovy Age of comics was mostly in black and white, and just out of reach on the magazine racks. Though a precocious reader, I was still a toddler in the mid 70s and missed out on a lot the Groovy Age’s classic works. This doesn’t mean they didn’t leave a lasting impression on me though. 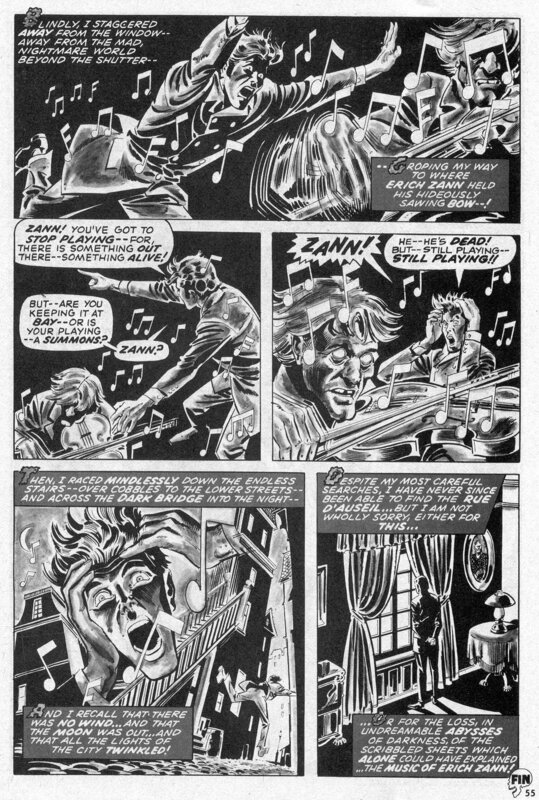 The first US comics I saw in the 70s, were black and white reprint anthologies that came out, on a weekly basis, from Marvel UK. The comic that had the biggest impact on me, age three/four, was Gene Colan and Marv Wolfman’s Tomb of Dracula. 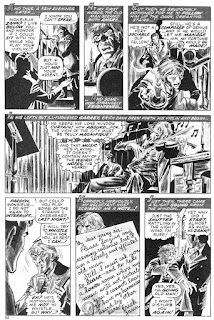 Colan’s wild, expressive pencils and Tom Palmer’s bold, inks left an indelible impression on me, before a well meaning adult snatched the pages from my hands, for fear it would corrupt my innocent, little mind. They were too late, the damage had already been done. 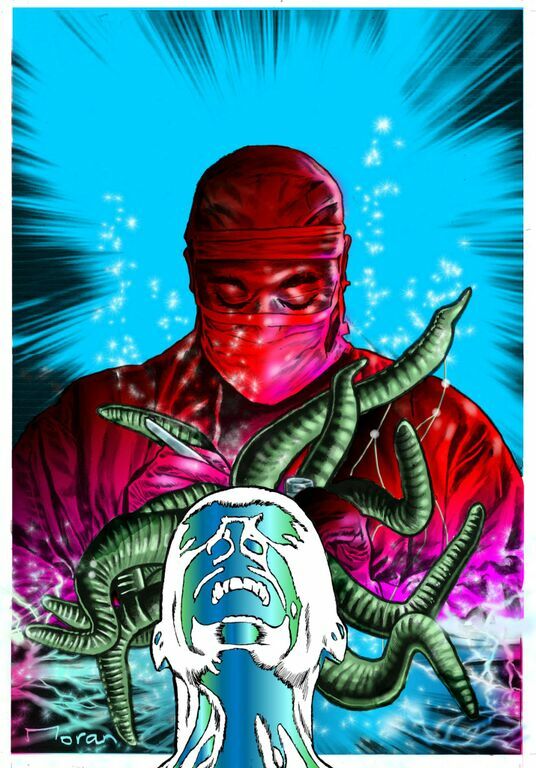 I was a comic fan for life. To this day I prefer to read the Tomb of Dracula in black and white, and while I collected a nearly full set of the run in the 90s, I like reading the collected Marvel Essentials volumes better. 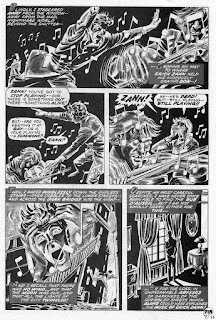 In the 80s, at the age of 12 and 13, one of the biggest influences on my reading were reprints of the Warren Comics and their competitors - Eerie Publications and Stanley Publications. These reprints were put out by tiny, one man publishers here in the UK. We also got Marvel’s black and white horror, around ten to fifteen years after it first appeared on US shores. At the same time as these black and white tomes were irrevocably twisting my adolescent consciousness, the pulp fiction of the 30s, 40s and 50s was also having a huge impact on my reading habits. Paperback horror collections were rife in 70s UK. Like many of the comics I read, I picked up these battered books in second hand book stores, thrift shops and yard sales. 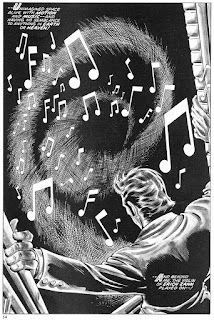 I quickly learned of the crown prince of pulp horror - H. P. Lovecraft, and began to see his influence on the horror comics I was reading. The cold shadow of Lovecraft’s cosmic entities falls heavily on a host of horror comics from the groovy age, and his brooding, gothic atmosphere can be seen in a huge number of the Warren and Skywald stories. However, there were a lot less direct adaptations of Lovecraft’s work than there are today. 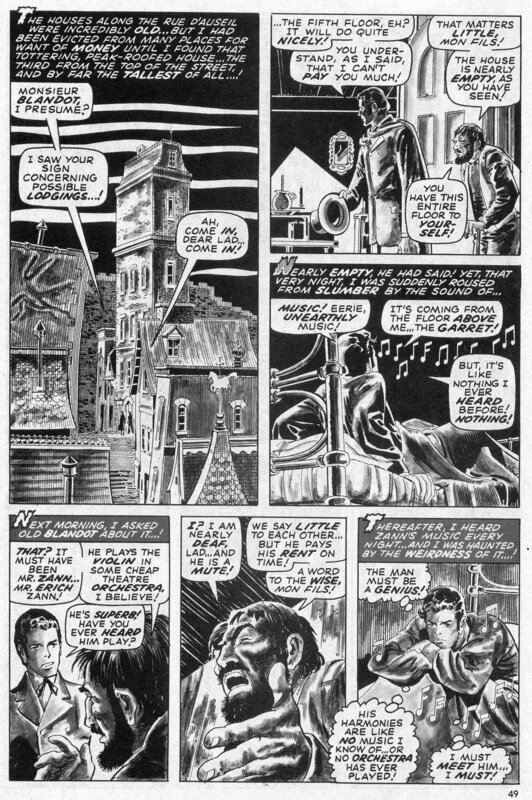 Notable examples include Berni Wrightson’s classic adaptation of ‘Cool Air’ in Creepy 113 with art so evocative it makes you wish Wrightson had turned his hand to bringing Lovecraft’s whole cannon to 70s comics. 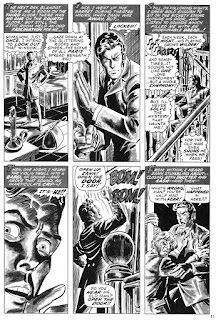 Given what a huge influence Lovecraft’s work had on the early stories in Warren comics, especially those penned by Archie Goodwin, I was surprised to find that Warren only undertook two other direct adaptations of Lovecraft’s work. ‘The Rats in the Walls’ in Creepy 21 and the Derleth/Lovecraft collaboration ‘Wentworth’s Day’ in Eerie 13. If you know of more, then please let me know in the comments below. While Warren’s biggest rival Skywald, drew heavily on the Cthulhu Mythos for many of Archaic Al Hewetson’s Horror Mood pieces, strangely it seems they never published a single adaptation of Lovecraft’s work. 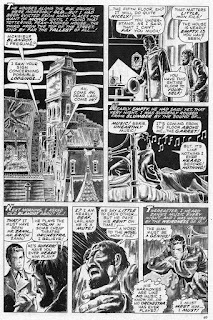 However Warren’s longest running rival, Myron Fass’s Eerie Publications did publish one black and white adaptations of Lovecraft’s work. The story was renamed (as was customary with Fass) and was a redrawn by Larry Woromay from a pre-code story of the 50s that had patently lifted its entire plot from Lovecraft without crediting him. However, ‘Demons and Vampires’ from Tales of Voodoo, vol. 3, no. 3 is quite obviously ‘Pickman’s Model’. 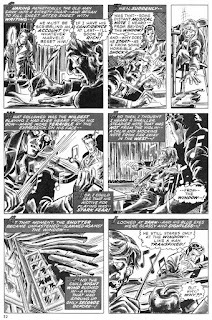 When it came to the all colour horror of the Groovy Age, neither DC or Charlton published any adaptations of Lovecraft’s work, though Tom Sutton did do some excellent homages for several of Charlton’s many Ghost Books. The House of Ideas however, published many of Lovecraft’s stories in comic form. Thanks in most part to Roy Thomas’s love of all things pulp and Robert E. Howard and Lovecraft in particular. He and Ron Goulart transposed many of Lovecraft’s best stories for Chamber of Darkness, Journey Into Mystery and Masters of Terror, with art duties from such leading lights as Gene Colan, Barry Windsor Smith and even the legendary EC alumni: Johnny Craig, who drew Thomas’s script of ‘The Music of Erich Zann’ for Masters of Terror, vol. 1, no. 2. The underground cartoonists were also huge fans of Lovecraft’s work. Skull 4 and Skull 5 included many Lovecraft stories adapted by Jaxon, Herb Arnold and a young punk by the name of Richard Corben, getting his first break (signing himself as ‘Gore’) who did a memorable version of ‘The Rats In The Walls’. Spain Rodgriguez also adapted ‘The Lurking Fear’ for Laugh in the Dark, from Last Gasp Eco Funnies. 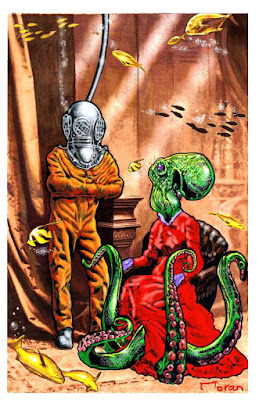 Lovecraft was embraced by Europe, as a master of the macabre, from the 1950s onwards, and the world of European comics was no different. In 1976 Phillipe Druillet published the visionary Lovecraft: Démons et Merveilles while Heavy Metal published many of Alberto Breccia’s ground breaking adaptations, which really set the bar for all other adaptations that have followed. 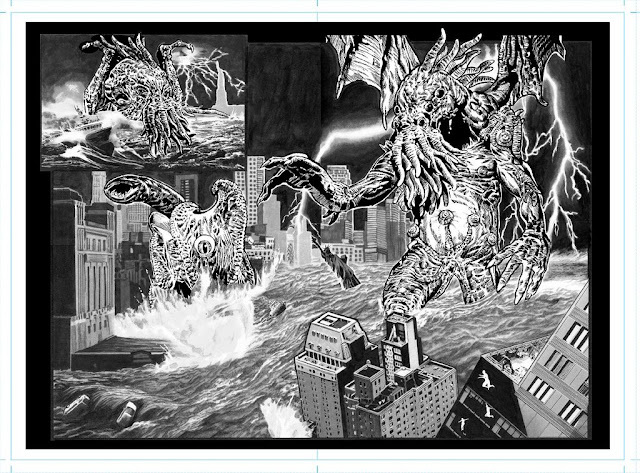 I have to confess, at this point, that I have a special interest in H. P. Lovecraft in comics, because I’m currently involved in a new portmanteau graphic novel that draws directly from Lovecraft’s work. In fact Ol’ Groove himself kindly invited me to do a guest blog so I could lay it all on you. It’s call ‘Beyond Lovecraft’ and is drawn by the multiple award winning artist Rob Moran. ‘Beyond Lovecraft’ is set in the apocalyptic aftermath of the return of the great god Cthulhu. A scattered band of survivors scratch a bare living, hiding in the shadows of their lost world. A tiny group of scientist from Miskatonic university find a way to access the fabled Library of the Yith. An alien archive that contains the entire history of the universe, first mentioned in Lovecraft’s novella: ‘The Shadow Out of Time’. We’re running a crowd-funding campaign, to raise funds to pay the creators, (we already have a publisher) which can be found here. We’re also offering a lot of unique perks including the opportunity to buy and own a house in the Lovecraftian town of Innsmouth, and it won’t break the bank (although it may cost your soul). Thanks to Groove for letting me tell you all about this and I do hope you get the chance to check out our campaign. Johnny Craig was truly a master of the form. 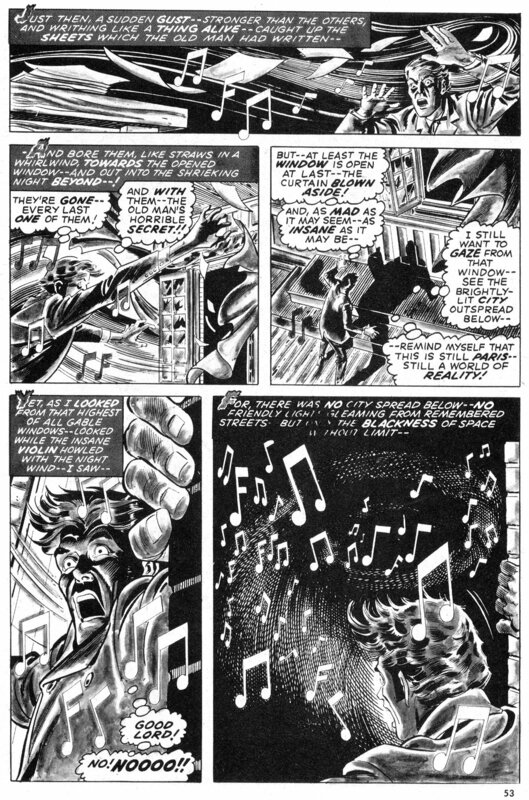 This elegant story makes me wish we'd seen more output from this legendary EC creator at Marvel (His Iron Man stories were great). I could not agree more, I would have loved to have seen more horror in this vein. He certainly never lost his touch. EXCELLENT essay! Guest posts of this caliber are always welcome! Thank you very much Bob, it's a great strip isn't it. This is why we love the Groovy One- a guest post PLUS the usual magic! No short cuts for the mighty one. He delivers! And to you I say as always...GROOVE ON! He certainly does deliver Dale, and GROOVE ON to you too.